During the 20th Century Wardour Street became the centre of the British film industry with the big production and distribution companies having their headquarters in the street. By the end of the century most of the big film companies had moved elsewhere, leaving some smaller distribution companies, independent production houses and post-production companies still based in the area., along with a number or preview cinemas. 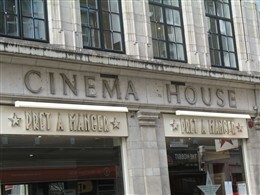 Film House at 142 Wardour Street, formerly the headquarters of the Associated-British Pathé film company. Now the headquarters of HMV Group plc. In November 1934 William Hinds, a comedian and businessman registered his own film company – Hammer Productions Ltd. based in a three-room office suite at Imperial House,Regent Street, London. 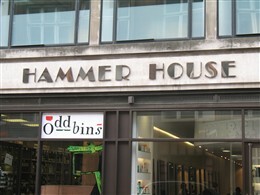 The company name was taken from Hinds' stage name, Will Hammer, which he had taken from the area of London in which he lived, Hammersmith. On 12 February 1949 Exclusive finally registered "Hammer Film Productions" as a company with Enrique and James Carreras, and William and Tony Hinds as company directors. Hammer moved into the Exclusive offices in 113-117 Wardour Street, and the building was rechristened "Hammer House" Hammer Films enjoyed great success from the 1950s to the 1970s producing a series of highly popular gothic horror films and television series. 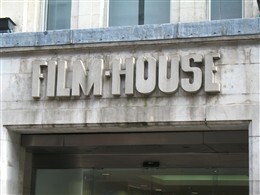 Although the company ceased film production in the mid 1980s it has recentlly changed ownership and has been revived. 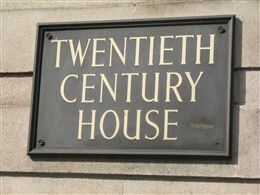 Twentieth Century House was constructed for the Twentieth Century Fox Film Company in 1936–1937, based on the designs of the architect Gordon Jeeves This followed the 1935 merger of the Fox Film Corporation and Twentieth Century Pictures in 1935 and the company has continued to operate from these premises ever since. Number 3 Soho Square is the headquarters of the British Board of Film Classification. This independent non-governmental body was originally established by the film industry in 1912. Its name was changed in 1984 following the passing of the Video Recording Act when the BBFC was given powers to classify videos for sale or commercial hire. The Video Recordings Act 2010 made it a statutory requirement for the BBFC to classify videos, DVDs and some video games. This page was added by Adrian Autton on 21/05/2010.